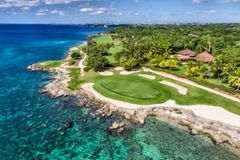 Casa De Campo is one of the most exclusive resorts in the Caribbean, boasting three championship golf courses and an endless list of luxury facilities, including 7 outstanding restaurants, a new Beach Club, a Marina, and 3 private pristine white sand beaches. In golfing terms though, the 3 Pete Dye golf courses include the number 1 ranked golf course in the Caribbean, Teeth of the Dog, alongside 2 other world class courses, Dye Fore and The Links golf courses. Not only do you have the choice of 3 amazing golf courses, you also receive complimentary golf carts for every round to enjoy. *Where applicable, the relevant promotions will be applied during the booking process. We found 2 offers matching your search. Since opening in 1973, this awesome course has been delighting the most adventurous of Caribbean visitors, but in recent years, a complete renovation of the layout has rendered it more ruthless than ever. The Teeth of the Dog can now be stretched to an astounding 7,350 yards, making it an unrelenting test of championship golf. The #1 course in the Caribbean and #39 in the world. Dye famously stated that ‘I created eleven holes and God created seven'; to explain this, it is necessary to have some insight into the remarkable terrain that the course spans. The seven holes that track the craggy Dominican coastline represent an unforgettable golfing experience, where the margins for error are barely visible, but where the views are truly mind-blowing. The course's name has left it with a serious reputation to uphold, but the recent renovations ensure that it does this and more. The only question that remains is, are you ready to challenge the great Caribbean monster? 27 holes, 7,740 yards from the tips, 7 holes perched on the edge of a 300 foot cliff that plunges into the Chavón River and stunning 360 degree panoramic views of the Caribbean Sea, the Dominican Mountains and the Casa de Campo Marina. That is what is on offer for golfers venturing onto the challenging Dye Fore Course at Casa de Campo. Throw in occasional 30 mph trade winds from the East and you have a course that can challenge the very best. Take on Dye Fore from the appropriate tees though and the course is not all about brute strength and ignorance, as mind boggling undulations, changes in elevation and a never ending series of holes that wind both left to right and right to left mean every facet of a golfer’s game must be razor sharp from start to finish. Boasting some of the best views on the whole resort, the Dye Fore Course also offers plenty of excellent photo opportunities. This 18-holes course offers spectacular views of the Caribbean Sea. The luscious Casa De Campo Resort is the most illustrious in the Dominican Republic, and is among the most luxurious destinations at which to enjoy a high class tropical escape. The 7,000 acre resort is perched on the south eastern corner of the exotic paradise, and is superbly equipped with all the facilities you could hope for in terms of accommodation, dining and entertainment. Your stay at the Casa De Campo Resort can be based at one of the sublime private villas, all of which grant immediate access to the golf and leisure highlights. Sleeping four people, the villas typify the enchanting experience of a golf holiday at the world renowned Casa De Campo. An alternative to the villas is to stay in one of the tropically decorated hotel rooms, which offer private balconies and splendid views of the golf courses. The resort has 13 tennis courts, water sports at the private beach, kids activities, clay pigeon shooting, a gym and lovely swimming pools. In addition, guests can indulge in a deluxe spa treatment, snorkelling and diving expeditions and horseback riding adventures. Enjoy anything from light snacks to fine dining in one of Casa De Campo's eight restaurants or six bars. Whole experience was fabulous, from the minute we arrived until picked up for airport return. Personal golf buggy facilitated movement around the resort, in particular to the beach and restaurants. Excellent choice of restaurants - La Casita at the Marina had fantastic seafood. Lovely beach - quiet and safe swimming. All staff couldn't be more helpful. Room overlooked 10th on Teeth of the Dog, and had lovely balcony to sit on in the evening. We were on all-inclusive and would strongly recommend to others - pay as you go guests had 15% + 8% taxes + expected gratuity on top of all food and drinks. Beautiful setting - the 8 holes on the beach are stunning. Course in excellent condition, and a fair challenge - not much rough, but lots of ocean to lose your ball. Caddies are mandated - both of us are competent golfers and felt these unnecessary - but they at least kept the course moving - but still 4-5-5 hour round. Highly recommended and a must play. Green fees were included in package and "reasonable" for resort guests, but silly prices if just visiting for the day.